On Friday evening we had the pleasure of hosting a keen and vibrant group of Beavers from the local 84th group along with their leaders and parent helpers. While the emphasis was very much on look and experience the exciting plants there was time to explain some of the curious occupants of the greenhouse including the black bat flower and a little plant related to coffee that provides a home to biting ants that protect it from predators. We also talked about bananas (currently in fruit again), pineapple (still in fruit), ginger and it’s relative Grains of Paradise (used to flavour gin). Ooh – what’s in there? Water plants often need lots of roots. The venus fly trap – definitely not tropical! Will it bite off my finger? Eager hands reaching for this slimy butterwort – urgh! 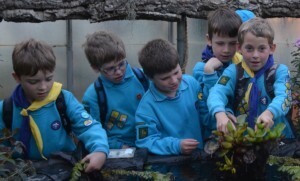 We all had a great time – plants are fun, they keep us alive in so many ways. This entry was posted in Hands-on, Interactive, Learning and Teaching, Public and tagged 84th Reading Beavers. Bookmark the permalink.